SINGAPORE - By all counts, it was a bold plan by the Singapore Tennis Association (STA): To bankroll two young talents to the tune of S$500,000 to train and compete full-time and, hopefully, turn professional. But more than two years later, and after the STA increased the number of players to eight, the scheme has hit a snag. TODAY has learnt that national Under-18 boys champion Rohan Kamdar, Geraldine Ang and Joy Chia have quit the programme. Parents said the STA's decision to have the youngsters train full-time instead of part-time with Technical Director Paul Dale was the problem. This move was announced at a dialogue session with parents on Monday and requires the eight players to quit school in order to meet the STA's criteria: Attend at least 85 per cent of the morning (7 to 10am) and afternoon (4 to 6pm) training sessions and compete in 10 International Tennis Federation tournaments a year. Ang Hock Chai, father of 14-year-old Geraldine, spoke of his frustration and disappointment. The full-time tennis coach also pointed to the hefty cost of homeschooling his daughter and providing tuition for her, which he estimates to cost about S$6,000 a year. Ang said: "The initial plan was to train full-time, and then they said to study and train part-time. Now they are suggesting that the kids go full-time because they are not committed enough and the STA want results. "My daughter's International Tennis Federation junior ranking has gone up in the last few months and there is no lack of commitment from her. The STA have changed their minds so much in the last six to seven months. My daughter wanted to play in the 2015 SEA Games here, but now her dream is shattered." The latest development is yet another about-turn for the STA, which had announced their plan in April 2010 to pick two players to train and compete full-time overseas. This was then expanded to eight players who were supposed to relocate to Madrid for full-time training. 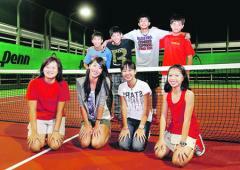 Last year, the STA said all eight players would train here and play tournaments overseas. STA President Edwin Lee said: "It's not fair to say that we keep changing our minds as we were trying to accommodate requests from those who wanted to continue schooling. (Having three players quit) is a bit of a setback … but we will open it up to others and give the opportunity to allow as many people to benefit from the programme."